Lately, I find my yarn stash (and my other crafty stashes) overwhelming. When I moved earlier this year, I did a small reduction, but it didn't seem to put a dent my collection. Even though I am lucky enough to have an entire room with a walk-in closet dedicated to my knitting/sewing/crafting, it was packed to the gills. I would love to be a complete crafty-minimalist and only have enough yarn, fabric, etc. on hand for a few projects, but I don't think that will be happening any time soon. Poor Cyllene (sə-LEE-nee), this cardi was started in April 2013 - YIKES! After finishing my latest pattern collection, Poseidon's Realm Part Two, I felt very guilty about neglecting this project. Dictynna is now available and THANKS! 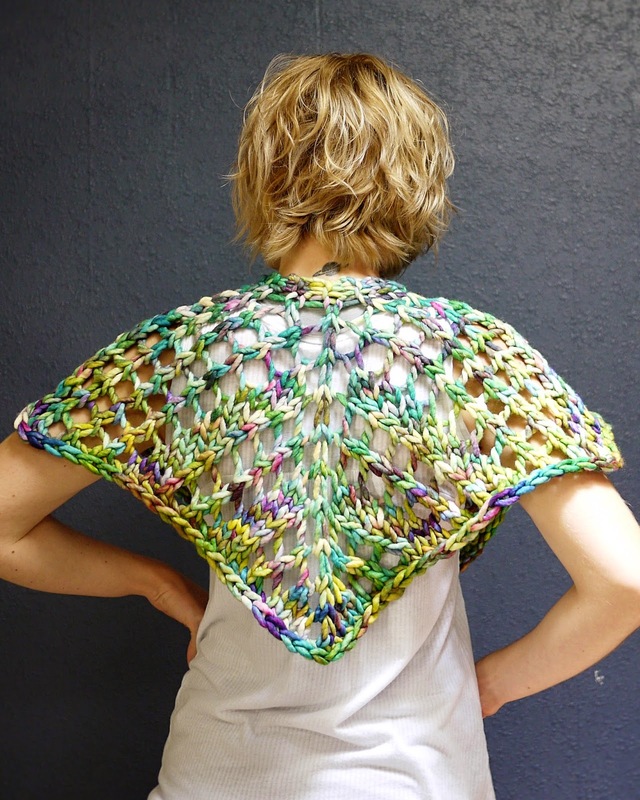 My Dictynna shawl pattern in Malabrigo Rasta has just been released! This is just the thing if you need to knock out some quick holiday gifts. 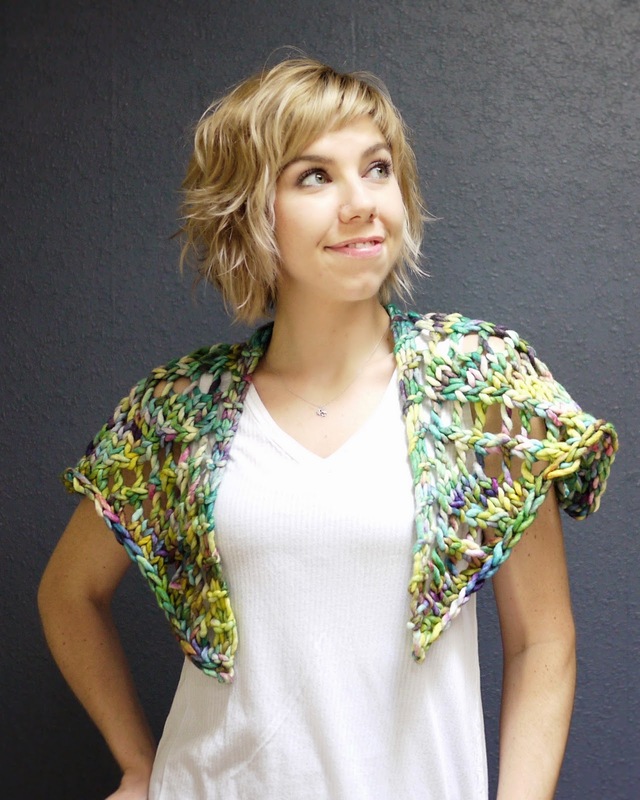 Super bulky yarn means that these shawls knit up in hours, not days or weeks. The split square shape is interesting to knit, it helps it stay on your shoulders and creates cool shapes when wrapped around your neck. New to super bulky yarns? Check out my previous post, Working with Super Bulky Yarn. It includes tips for knitting with super bulky yarns, brands of large circular needles and helpful notions. Since this is a time in the US that we take to be thankful for what we have, I just want to say thanks to you! I know I often neglect my blog and take some publishing hiatuses, but without you guys I would have given up long ago. Thank you for supporting me so I can do what I love! 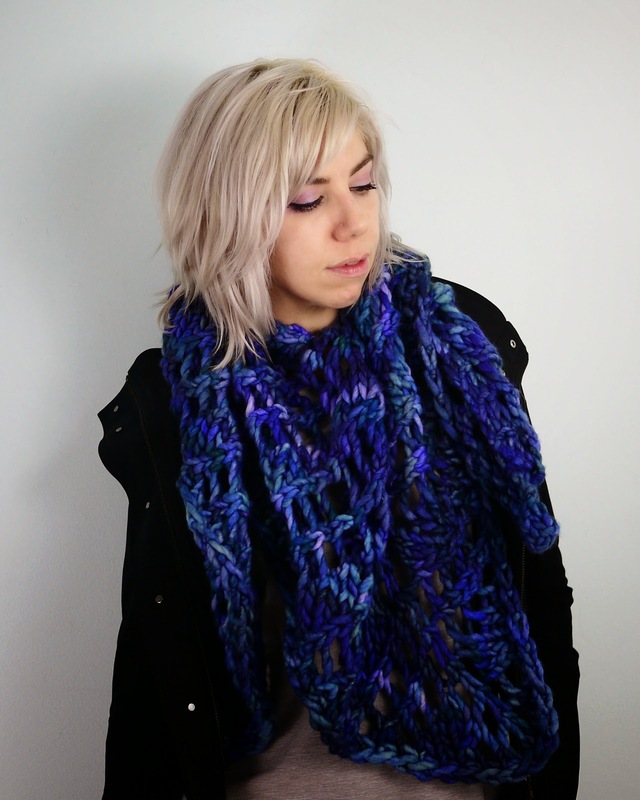 Now through 11:59pm EST on November 28 2014, use the code "thanks" in my Ravelry store and receive 25% off your purchase...all self-published patterns and eBooks are included. Also, since I have totally spaced on posting about it here, I am participating in the Indie Design Gift-A-Long. It is a huge event featuring close to 300 inde designers. There are multiple daily prize drawings, KAL/CALs and tons of fun. The event runs through the end of December so there is still a ton of time to join in! Malabrigo Rasta in Azules shown with KA US19 circulars. So super bulky yarn...seems to be a bit of a love/hate thing (though, I guess that is pretty much everything in the fiber arts world)? Personally, I love it! There is nothing like whipping up a lace shawl in a few hours. 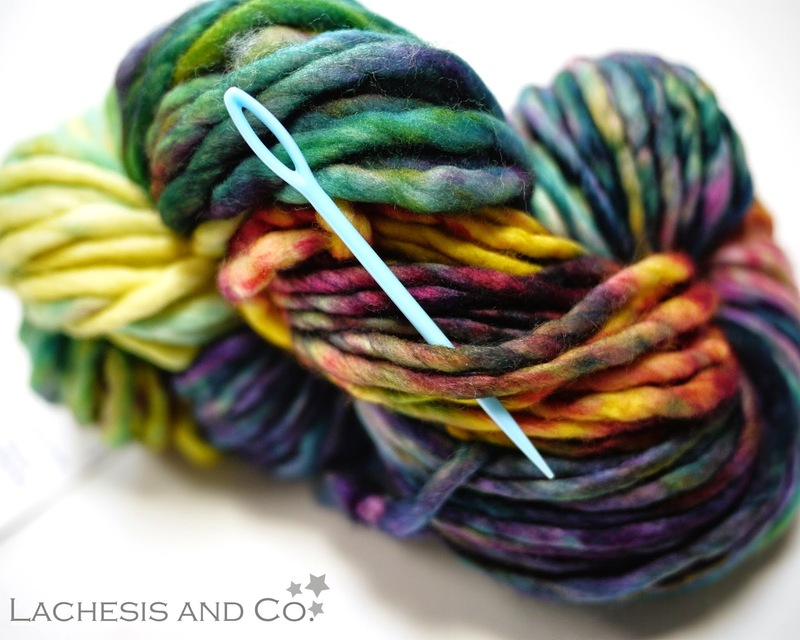 Plus, the colors of yarns like Malabrigo Rasta and madelinetosh A.S.A.P. are gorgeous. However, I see complaints all the time about working with knitting needles that could double as broom handles. Now, I can't promise to make you love knitting with broom handles, but I do have some tips that might make it marginally more enjoyable! Choose your needles well. I almost always use circular needles, even with super bulky yarns (SBY from here on out). Of course, circular needles size 19 (15mm) aren't the easiest thing to find. Most big box craft stores will carry plastic Lion Brand circulars, I have a pair but I almost always use my KA Bamboo circulars. Addi makes metal circulars in size 19. Quite a few other brands including Knitter's Pride and Susan Bates make larger circulars. Find a pair you like and it will make knitting SBY easier on you! Figure out the stitch marker situation. 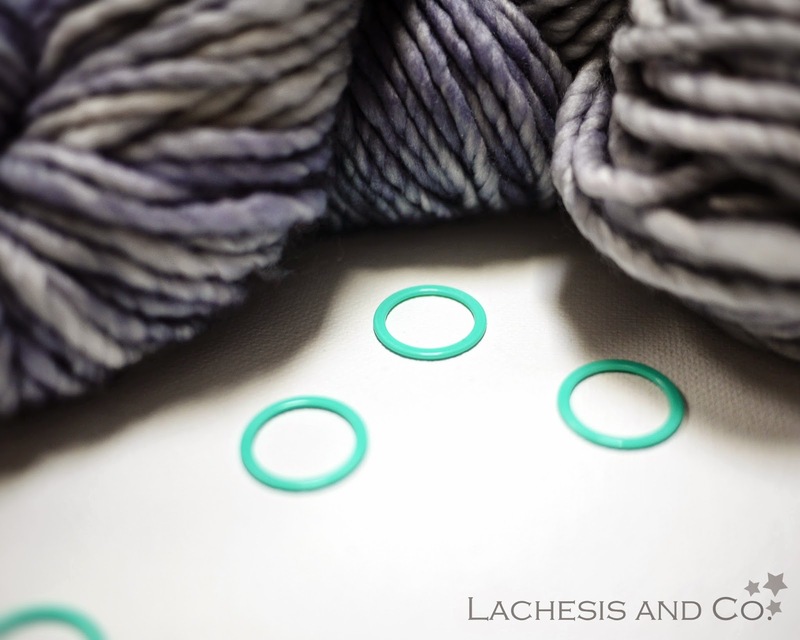 I know not everyone likes or uses stitch markers, but I always include them in my patterns because it gives any easy reference point for me to refer the knitter to. I use these stitch markers that I picked up one of my local craft stores. They are nothing fancy, but they do the trick. The main thing to watch out for is super bulky yarn overs jumping to the wrong side of the marker or the yarn getting caught under the markers. If you find it easier, you can just use loops of waste yarn. madelinetosh A.S.A.P. in Moonstone shown with Clover jumbo stitch markers. Gigantic plastic yarn needles! Big ol' ends need to get woven in somehow. I suppose wood or metal work too, but I have only ever seen the super huge plastic ones locally...again at the neighborhood craft store. Malabrigo Rasta in Arco Iris shown with Susan Bates plastic yarn needle. Finally, take your time and take breaks. Knitting with SBY is already super fast, so there is no need to try to set a new knitting world record! Big needles, big yarn and big stitch markers are clumsy and awkward...best to take it slow so you don't have to rip out any work and breaks will help keep your hands (and wrists and arms) happy. I give you these tips to prepare you for the release of my next SBY pattern, Dictynna, which will be available next week. Dictynna joins my other two SBY patterns: Ovate and Cordate. To date Ovate is my best selling pattern, so maybe not as many people hate SBY as the forums would have you believe...or maybe they just tolerate it for an FO in no time? 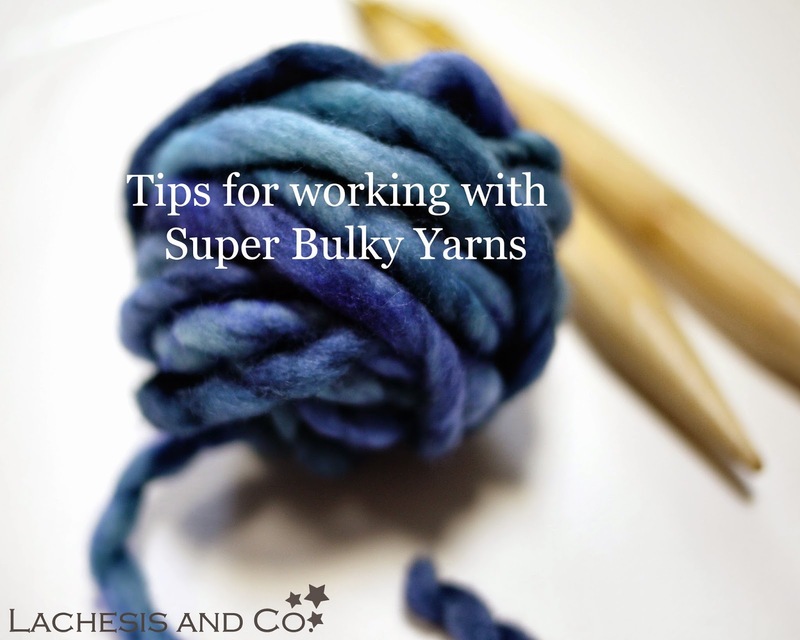 What do you think of super bulky yarns? Finery's up, Crinaeae's on deck and Poseidon's Realm Pt. 2 is in the hole! Since things have been back on track for a bit, it is nice to finally start seeing some progress! The great sample knitter experiment is underway. So far, so good. First up is Finery, which was released on Friday. I love doing fun and colorful striped and patterned cardigans like Coastal Hoodie and Thyone, but sometimes it is nice to have a classic cardigan that will go with anything! That was the idea behind Finery. A simple, easy to knit cardigan with a few fine details to dress it up a bit. Also, as an aside, I just got my haircut and I LOVE it! I hate taking a ton of time to do my hair, so nothing beats the magic of a wash and wear style for me. Especially in the summer, in the south...the local weatherman described the weather for this week as "an oppressive stretch," I can't wait. Fall always takes too long to come! On deck is Crinaeae, a cable and lace cardigan, also with a coordinating hat. I have almost finished up the samples, which have taken forever due to my CTS. I figured it was best if I finished them instead of sending them off to a sample knitter halfway done. My main concern was that the it would be pretty hard to get an exact gauge match and I didn't want a noticeable line on the cardigan where there was a pinch knitter (to keep the baseball references going)! I don't have any shots of the set for you right now, but I am hoping that everything will be ready to roll on this very soon! I love Rasta so much, nothing like instant gratification. Especially for someone like me that doesn't get that very often. I know some of you hate knitting with large needles, but at least it is only for a very short amount of time, right?! Knitting style, that is. In an effort to reduce stress on my wrists and maybe even speed up my glacial pace a bit, I have been trying different knitting styles. I am sure you have seen the debate that rages on about changing styles. At least once a week or so, a thread will pop up in the "Techniques" forum on Ravelry asking which is the best, fastest, etc. knitting style. Of course, the responses tend to run the gamut from "knit more to get faster at your current style" to "Continental is obviously the fastest" which is then countered by "the world's fastest knitter knits English" and on and on. At least most people tend to agree that it is good to have more than one style in your arsenal. I think it tends to be a lot like running. When I was a marathon coach and still now, working a few hours a week at a running store, I am always asked if it is a good idea to change your running style. It is also often for the same reason that knitters want to change their style: to get faster, more efficient and to prevent injuries. But, changing a style that has become second nature can be quite difficult, whether running or knitting. Here I am with the second installment of solutions I have implemented to help with the common knitter/designer issues I have come up against this year. Check out Part 1 for the first bit and back-story. The next solution on my list is to stop sitting so much! I did that, but my productivity suffered quite a bit. I could only sit for so long, either knitting, sketching, or at the computer. If I ended up sitting for too long sketching, I would be done for the day on any other sitting work that needed to be done. This one is definitely not a cheap solution, but only 24 hours in and I am in love: a standing desk. Here is a little cell phone shot of my new baby...after the jump.